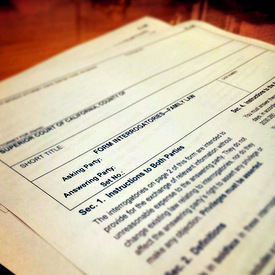 The “Form Interrogatories – Family Law” form contains 21 pre-written questions. A divorce attorney is only required to review the questions and check the box of each one that he or she wishes the opposing party to answer. If the box next to a question is checked, the responding party is required to answer the question under oath within thirty days. At the end of his or her responses, the responding party is obligated to declare under penalty of perjury that the answers given are true and correct. In divorce cases, the income of both parties is highly relevant to the issues of both child and spousal support. In California, spousal support is commonly referred to as “alimony”. 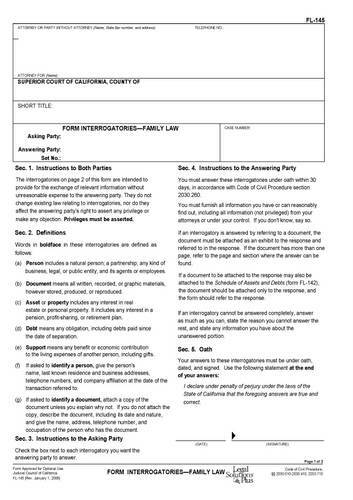 The “Form Interrogatories – Family Law” allow Del Mar divorce lawyers to ask the responding party about his or her current income in addition to any other cash or property he or she received in the past three years. In all divorces cases, as long as the parties have community property assets, property division will be necessary. The family law interrogatory form contains questions regarding property valuations, property held by others, retirement and other benefits, and even gifts made of community property. 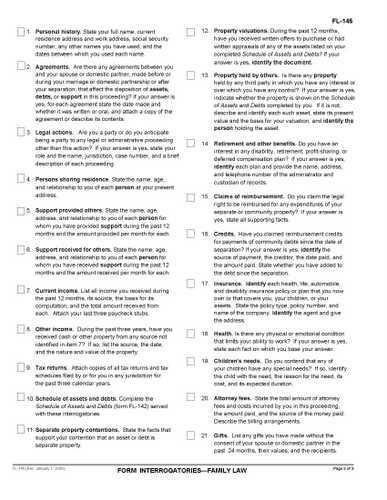 More importantly, the form gives attorneys the option of requiring the responding party to complete a “Schedule of Assets and Debts”. A Schedule of Assets and Debts is another form which asks the declarant to list out each community and separate asset he or she has an interest in. This is an efficient method for attorneys to determine what assets need to be divided at the end of the case. Finally, the family law interrogatory form contains questions regarding alleged agreements between spouses regarding assets, debts and support; claims for reimbursement, and claims for credits. By asking these questions, an attorney can determine what the opposing party is asking for and what arguments he or she plans to present in support of his or her claims. Please contact us if you are considering a divorce from your spouse, a legal separation, or have questions regarding the discovery process. Nancy J. Bickford is the only lawyer in San Diego County representing clients in divorces, who is a Certified Family Law Specialist (CFLS) and who is actively licensed as a Certified Public Accountant (CPA). Don't settle for less when determining your rights. Call 858-793-8884 in Del Mar, Carmel Valley, North County or San Diego.